Apple appears to have acquired popular music plug-in and effect maker Camel Audio, based on information found on corporate registry site Companies House [PDF]. Camel Audio's address has been updated to 100 New Bridge Street, which is Apple's London address, and the company's sole director is now listed as Apple lawyer Heather Joy Morrison, suggesting the company is in the possession of Apple. Camel Audio is known for its range of plug-ins, synthesizers, effects, and sound libraries, which were available via the company's Alchemy software. Previously available for $249, Alchemy included more than 1000 sounds, 5.5GB worth of samples, a powerful additive resynthesis engine, spectral resynthesis, a virtual analog synthesizer, and more. 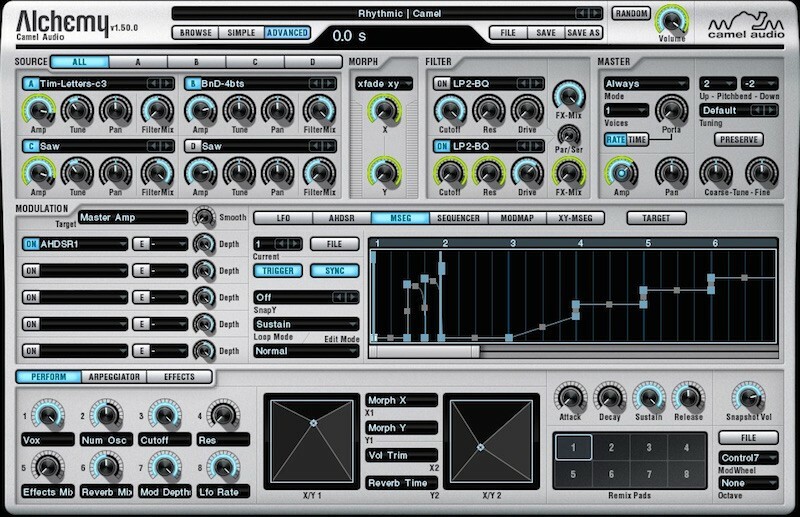 Its powerful engine was highly useful to those who liked to create and manipulate audio for unique sounds. We would like to thank you for the support we've received over the years in our efforts to create instruments and effects plug-ins and sound libraries. Camel Audio's plug-ins, Alchemy Mobile IAPs and sound libraries are no longer available for purchase. It is not known what Apple plans to do with Camel Audio, but it's possible the company's technology could be incorporated into a future version of Logic Pro X, Apple's software designed for professional musicians, or GarageBand. Update 2/24 12:33 PM PT: The Loop's Jim Dalrymple contacted Apple for a comment on the possible purchase of Camel Audio, and the company gave him its standard statement on acquisitions: "Apple buys smaller technology companies from time to time, and we generally do not discuss our purpose or plans." You would think they want a product that competes or is better than Lightroom. Apple is starting from scratch. There's no way they could release a 1.0 product to match that of an app going on its 6th major iteration. What they could do is create the foundation for a new approach and then aggressively build on top of that like they did with Final Cut Pro X.
I'm a pro photographer and I have to say that while Photos won't fill my needs, I'm very interested in what looks like a scalable foundation for what could become the standard for photo organization and editing. I find it hard to believe that Apple has dropped professional photographers after so much focus on professional audio and video. Photography is arguably the largest market of the three. I think Photos is going to surprise in future iterations. I hope they change the name to Camel Tone. I think Photos is meant to be more of a platform than a complete professional photography product. I think it's about creating a good API and giving developers OS-level integration to libraries of photos. At launch, it will be pretty bare. Either Apple or someone else will make plugins or whole applications that live on top of Photos but offer more advanced functions. Maybe this isn't a good example, but it's similar to how Quicktime has deep OS integration on OSX, and thus any video-related app that supports Quicktime and uses the Quicktime APIs runs so much better on OSX than one that doesn't use Quicktime. Except, with Photos I hope they do it better than Quicktime. Photos might be able to compete with Lightroom after a few major updates. We all remember how limited Final Cut Pro X was at launch... but it eventually got better. Apple threw out all the old code in FCP7 and started from scratch. Here's to hoping Photos follows a similar path. Haven't Apple already said that the Photos app is meant as the repository, with other companies being able to make plug-ins via API's into it? If so, then that makes a lot of sense IMO. I presume this isn't good enough for pro's though, n'est-ce pas? Wow, I like Logic even I like Digital Performer better. But Logic is a good boy. Now with the addition of alchemy... wow. Actually I needed to do a live recording 2 weeks ago and I had an old 6 channels M-Audio interface. I wanted to run it with Protools but I needed to get PT 11 and buy the upgrade. I connected the interface to Logic X and it was recognized with no problem. I recorded the live show for 2 hours in my mac book pro without any issue. Logic is worth the money. I know there are great softwares out there but Logic is one.